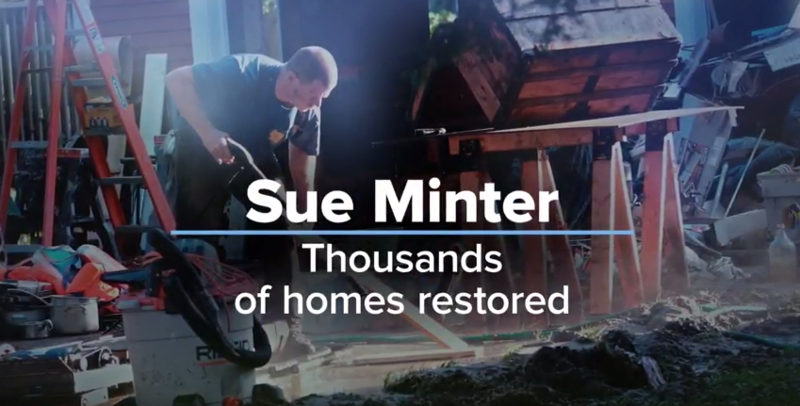 Democratic candidate for governor Sue Minter dropped her first campaign commercial Tuesday, touting her work in state government in the aftermath of Tropical Storm Irene. The ad, titled "Count On," focuses on Minter's role in helping rebuild homes and roads after the 2011 storm hit a large swath of the state. She was deputy transportation secretary before she served as the state's Irene recovery officer and then as transportation secretary. "Sue Minter helped lead the rebuilding," a voice-over says. Pam Clapp, a Washington County resident affected by the storm, appears in the ad. "She got us back on our feet; gave everyone hope that we would get through this together as a community," Clapp says in the 30-second spot. Minter is the second Democrat and third gubernatorial candidate to air an ad. She's one of three Dems seeking the open governor's seat in an August 9 primary. Her campaign spent $20,872 to air the spot on four area television stations this week, according to Federal Communications Commission filings. This week and last, rival candidate Matt Dunne spent $55,254 with the same stations to air a television ad titled "What Bernie Started." His campaign said at the time it had committed to a six-figure ad buy through the primary election. Minter and Dunne, a former state senator and Google manager, are competing with former state senator and ambassador Peter Galbraith for the Democratic nomination. Democratic Gov. Peter Shumlin is retiring after three terms. Republican Bruce Lisman, a retired Wall Street executive, has been airing TV ads for the last five months. Lisman is running against Lt. Gov. Phil Scott for the Republican Party's nomination.